Since the beginning of time, there has been 2 existing forces, good and evil. It is the basis for most stories and in fact the basis for all of life itself. God vs Satan, War vs Peace... however you look at it, there is always a ying to the yang. 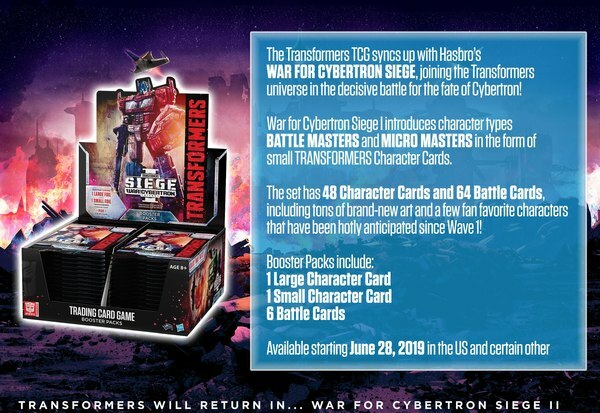 The Transformer universe is no different in this respect. Transformers the Movie introduced us to evil incarnate, Unicron, the planet destroyer who seemed to encompass all that was evil in the universe. 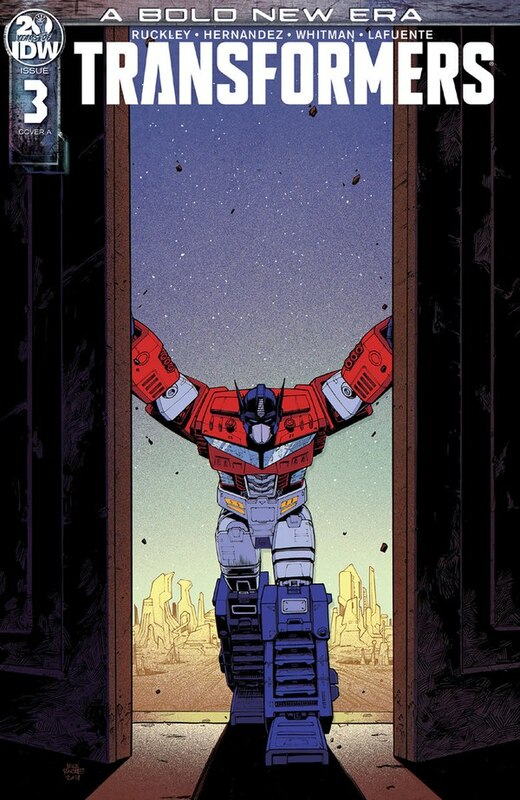 Marvel Comics introduced Primus, the creator and protectorate of all Transformers who laid in suspended animation until the destined battle between him and Unicron was at hand. 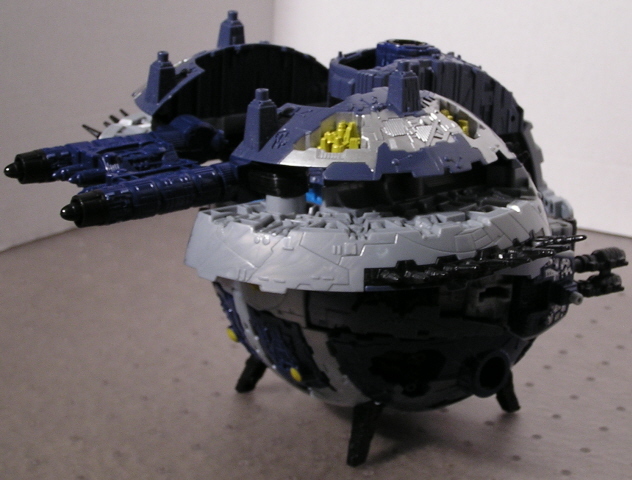 In 2002, the Armada series brought fans Unicron after 15yrs of patient waiting. 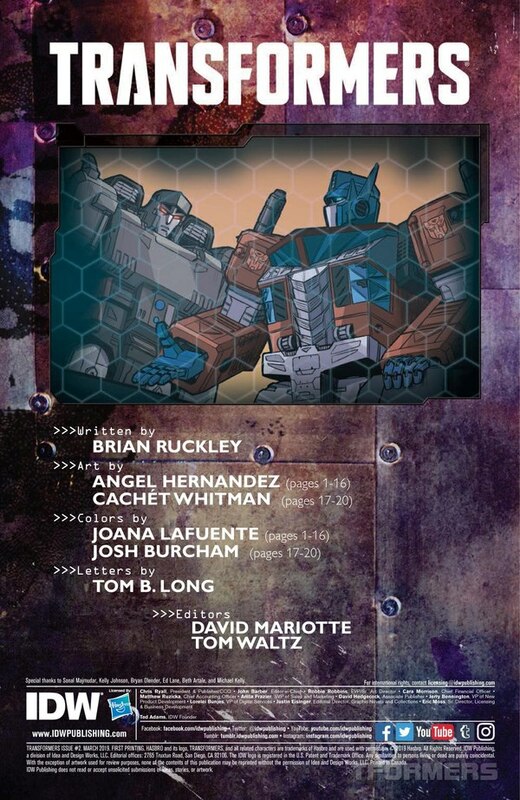 Now, in 2006, the Cybertron series brings us the much anticipated second half of the eternal Good vs Evil struggle... Primus. 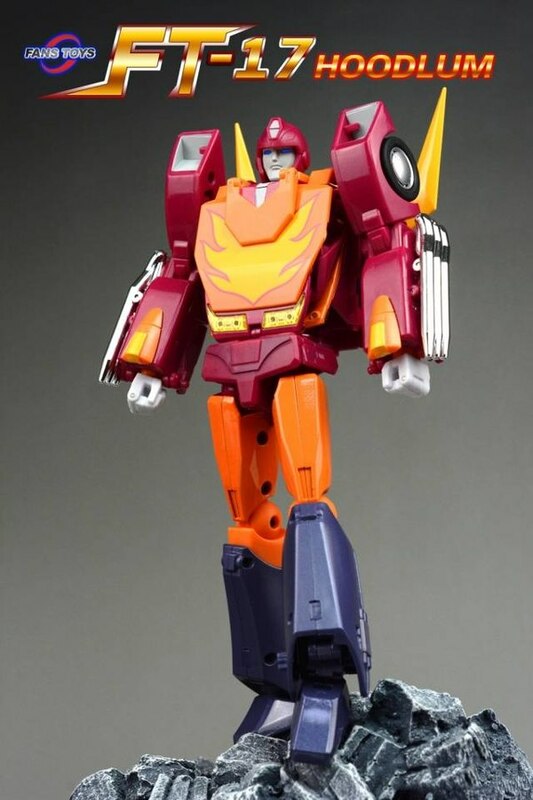 Primus' alt form is nothing less than the planet of Cybertron itself. 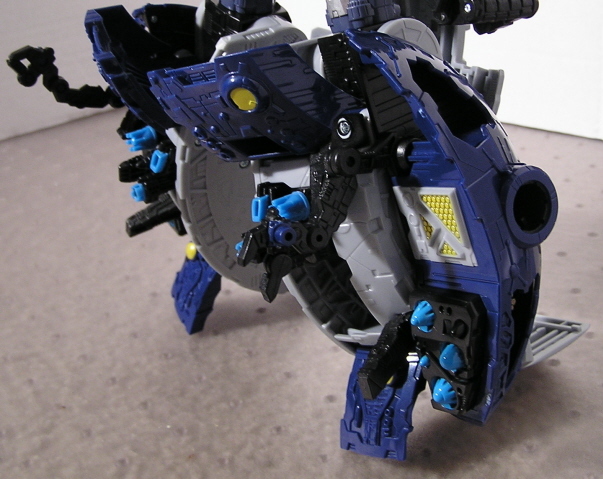 There were issues with Unicron's alt mode in that it wasn't fully spherical and exposed leg kibble. With Primus, that has been fully rectified. This is a perfect sphere of a planet. 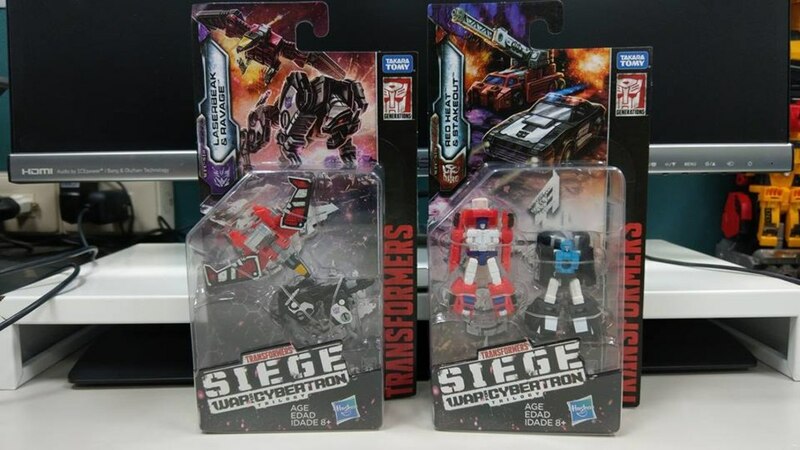 4 spires have been thoughtfully engineered to act as stands to keep Cybertron level. Cybertron itself is full of nice details, with rubber spires and detailed surfaces. The only real kibble are 3 round ports, which serve a later purpose. The colors are what you would mostly expect, gray with navy blue and yellow highlights. 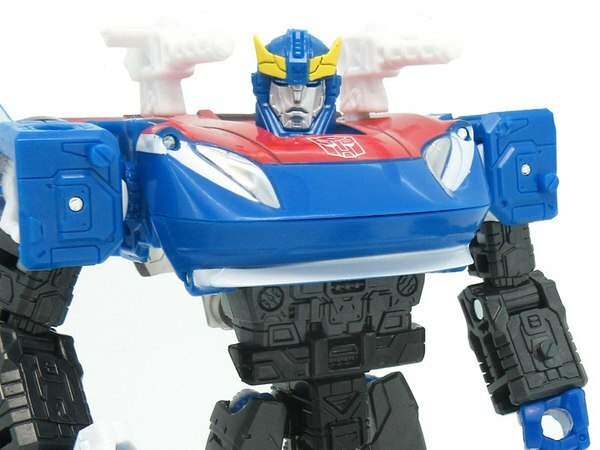 This alt mode is truly a work of art. 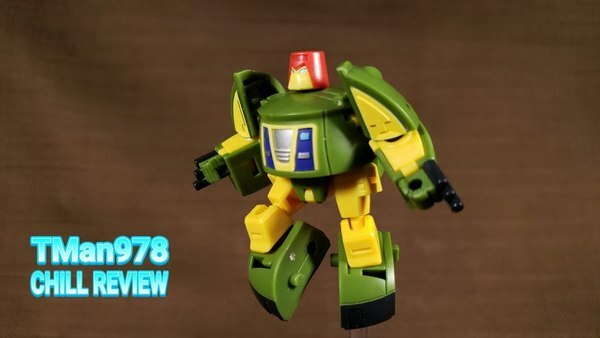 Primus includes his own Cyber Key, which is an unpainted Autobot key. Inserting the key into slots on the sides will pop out twin mortar cannons. There are 2pairs of cannons total. Also notice that each cannon has a minicon port. In total, there are 7 minicon ports, including 4 on the top of the planet and one towards the front. 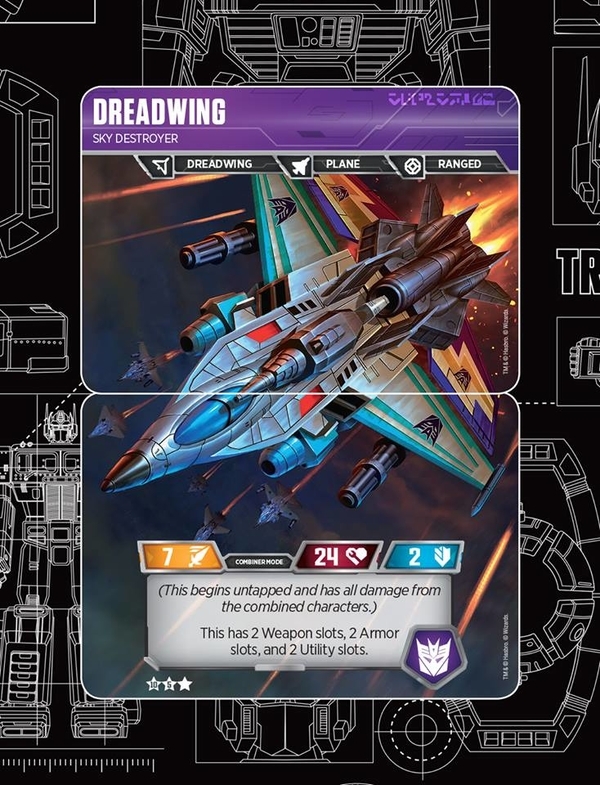 In case 4 cannons don't pack enough firepower for you, you can use the Omega Lock key, which is also included with Primus, to activate the Stellar Converter Cannons. These cannons feature a firing projectile. Also, should you have inserted 2xAA batteries, you will get some interstellar sound effects. Not good, but not terribly bad either. Before we go further, let's look at the Omega Lock for a moment. The Omega Lock is literally the key to unlocking all of Primus' potential. The lock holds up to 4 Cyber Keys. The example above shows all 4 Cyber Planet keys installed, but any key will fit. The keys fit somewhat loosely, and in general serve no purpose besides looks. 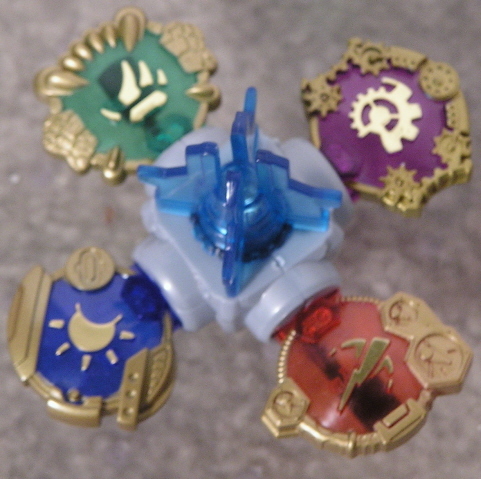 The Omega Lock is used to transform Primus between modes. At certain points, you must insert the key into one of the round ports mentioned earlier and either push or twist to expose or rotate parts to complete the transformation process. 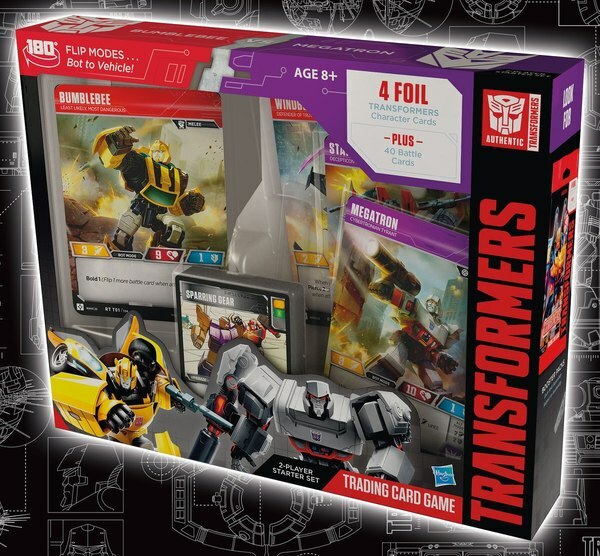 There are 2 different modes to transform into. 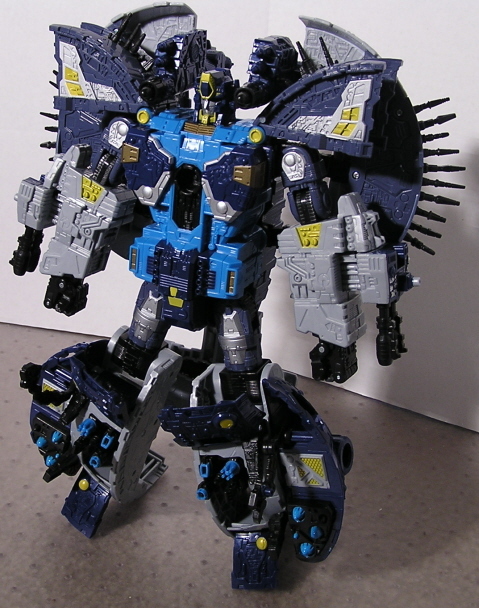 His Battle Station mode is a half-transformation to his robot mode. A load of weaponry exposes itself in this mode, including gatling guns, laser cannons, port cannons and missile batteries. 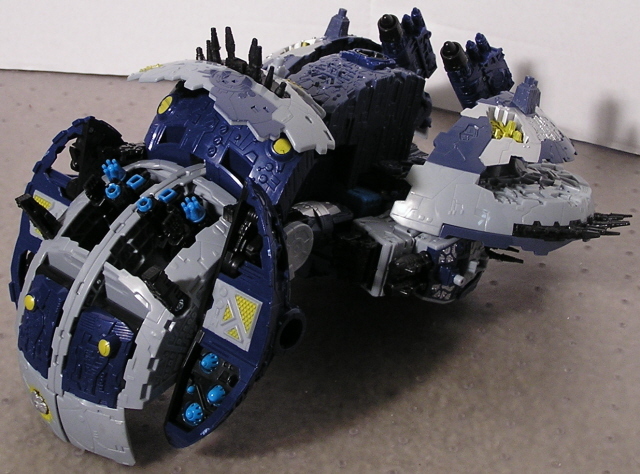 The Stellar cannons are also useable from the rear. You have to wonder who something so massive would convert to a battle station. Straigtening up some pieces and finishing the transformation will yield you the robot mode. 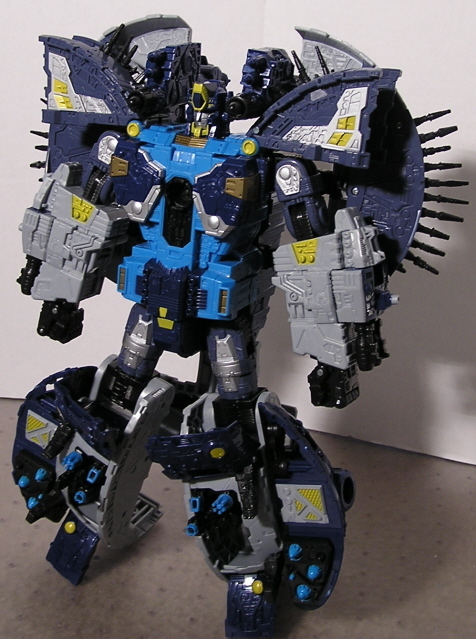 Primus' robot mode is equally as awe inspiring as his alt mode. More blue shows up, including a medium blue. The arsenal exposed in Battle Station mode is still useable on his legs. The Stellar cannons now rest on his shoulders and you can now see the twin mortar cannons on each arm. Primus has a full range of motions. 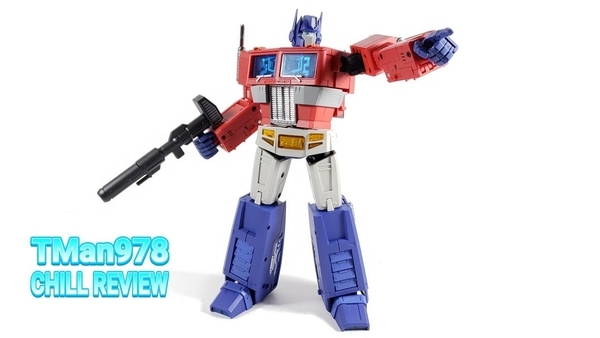 Like Unicron, he has fully knuckled fingers for loads of possibilites. 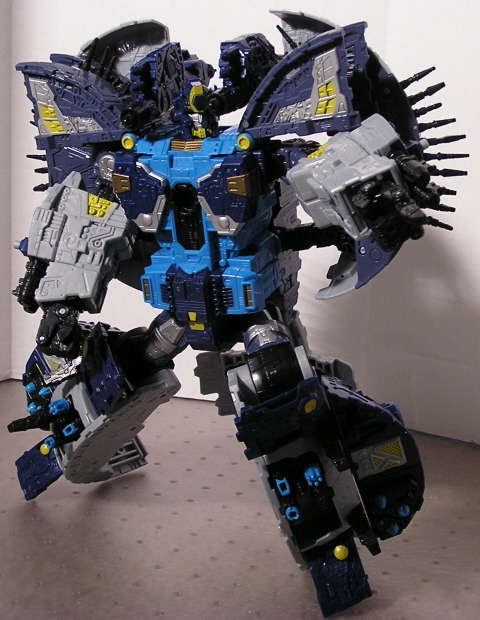 Although he is smaller in stature than Unicron or Supreme Starscream, he is still massive. Inserting the Cyber Key into each arm will pop out and extend the mortar cannons in the same way that it did in his alt mode. Not that he needs more firepower, but overkill is sometimes nice. There is one last detail to touch on. On his calves, there are mechanical arms. 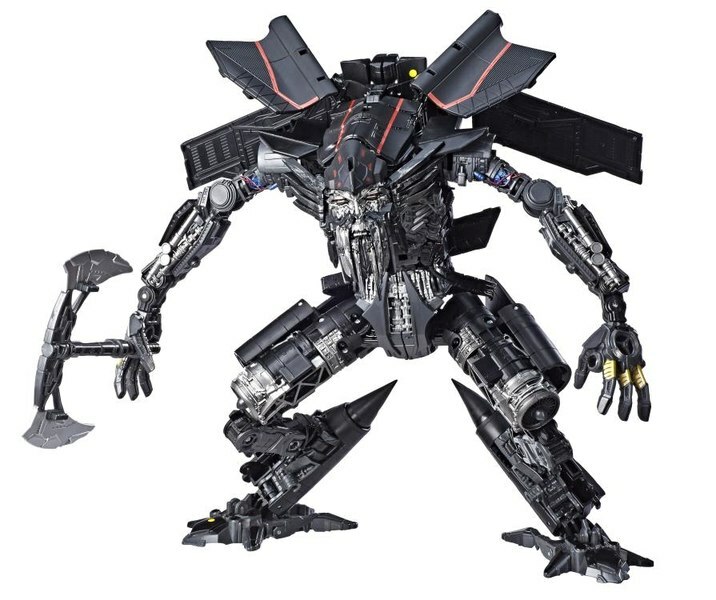 They have 3 joints and the claws are moveable. There is one arm for each leg. HasTek crafted a pure winner with Primus. 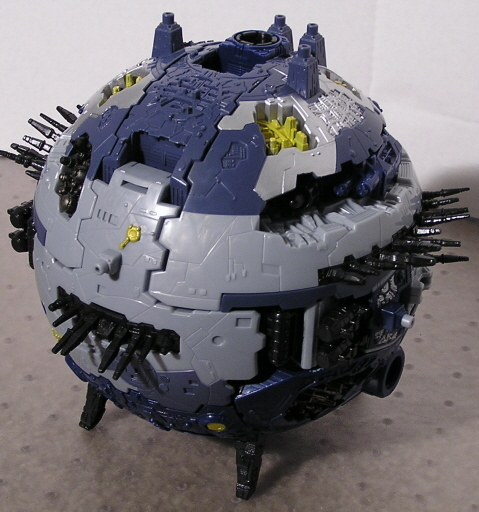 They took all the bad aspects of Unicron and eliminated them. 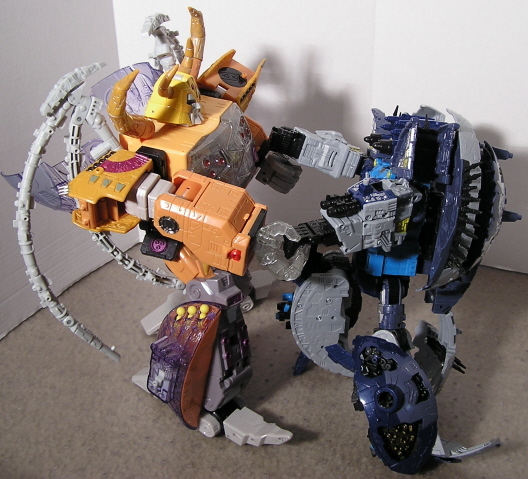 They took the good qualities of Unicron and improved on them. 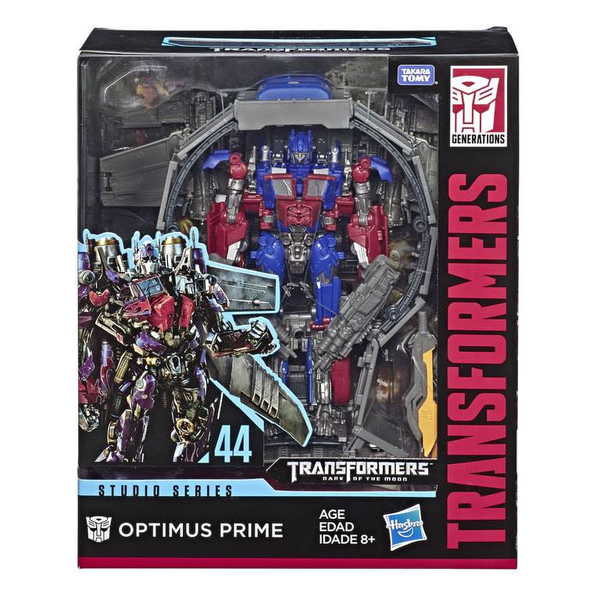 Primus is a hefty piece of change for sure at $50 MSRP. If you find one at Toys R Us, you will also get Unicron's Head as a mantlepiece. I found this model at Target, which does not offer the head. To me, that's no big deal. I'm still very happy with the bang for the buck quotient. Now... let the true battle of Good vs Evil begin!